The 2009 Annual Seminar was held at the National Portrait Gallery, London, on 20 October. Below you’ll find synopses of some of the presentations made. Bernard helped demystify copyright by giving a clear definition of what it is, what it protects and how long it lasts. Bernard then discussed the importance of having at least an awareness of the sometimes strange world of intellectual property lurking behind physical objects. One fundamental point is that the owner of an object and its copyright can be different parties. Another is that the heritage sector needs to show exemplary compliance with copyright laws. In addition, there are sadly few copyright ‘exceptions’ that benefit the arts sector. Bernard also explored some specific issues to do with portraits and copyright. He finished by signposting participants to further useful resources for continued copyright bliss! The art collection at Blenheim Palace passed smoothly down through each generation till 1886. The most important collector was John Churchill, 1st Duke of Marlborough, the great military hero for whom the Palace was built. The richly decorated interiors then displayed tapestries, bronzes and old master paintings as well as newly commissioned works by Kneller and Jervas. Subsequent Dukes added to Blenheim’s riches with paintings by Reynolds, Gainsborough, Stubbs, Romney and Cosway (to name but a few). However, the mid-19th century fall in land values compounded with an agricultural depression led the scientifically-minded 8th Duke to order the dispersal of the most valuable parts of the collection – through private sales and through a five day auction at Christie’s. The collection today consists mainly of portraits, highlighted by four important and imposing group portraits of the Marlborough family (by Closterman, Hudson, Reynolds and Sargent). Since its acquisition by the NPG in 1911 Sir Joshua Reynolds’s first portrait of Dr Samuel Johnson has had three significantly different incarnations. 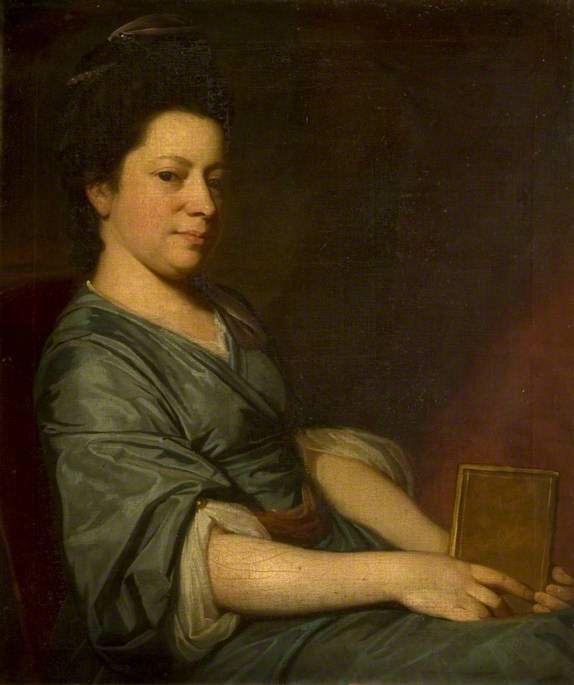 Reynolds began the portrait in 1756 but it was never exhibited and remained in his studio until Johnson’s death when he gave it, unfinished, to Johnson’s biographer, James Boswell. By the time the painting entered the NPG collection it was described as having “been painted on” and appeared ‘finished’ though not necessarily by Reynolds. The painting remained more or less untouched until 1976 when its condition became so poor that the conservator Bettina Jessel was commissioned to undertake its cleaning and lining. Her thorough examination led her to believe that certain visual elements and alterations to the figure were later additions. Consequently she removed the card table and painted over the books. Thus changing the appearance dramatically. In August 2007 the painting was attacked by a member of the public. The subsequent treatment gave the gallery the opportunity to revisit the 1976 restoration. New examination could shed no further light on the authenticity of the elements she removed though it did provide fresh insight into Reynolds’s technique. A symposium of Johnson and Reynolds experts held in June 2008 produced a general feeling that the return of the books would be welcomed. Since 1976, documentation had come to the gallery’s attention strongly suggesting that Reynolds was aware of the additions which appeared in an engraving by Heath of the portrait. These factors, together with a study of contemporary portraits by Reynolds, were enough to reinstate the books without having the same degree of ‘finish’ elsewhere. The face now shows little more than undermodelling and Reynolds’s swift and sketchy brushstrokes are less disguised; thus the appearance of the painting has changed again. Philip explained how the Oxford DNB may be used for portrait research and as an accompaniment with exhibitions and education outreach. The Oxford DNB includes entries on more than 57,000 men and women from the Romans to the year 2006, of which more than 10,500 are illustrated with a portrait likeness, researched in association with the NPG, London. Philip’s talk looked at two routes to research: the people connected with portraits (as artists, sitters, collectors, patrons) and the portraits themselves. Individual articles offer helpful content for portrait researchers, including accurate life dates (researched from primary sources) and chronologically precise name forms of use for identifying sitters variously known by birth, title or multiple married names during their lifetime. Entries also list primary and secondary sources relating to the subject, and links to accredited external sources such as the NPG’s holding of an artist’s works. Where available, articles also provide details of a person’s archives, wealth at death (drawn from wills, inventories and probate records), and a listing of all known likenesses (presently 30,000 works), whether or not the person is one of the 10,500 illustrated in the ODNB. Each of these elements may be seen in the ODNB’s biography of William Hogarth. The ability to undertake similar research for sitters and patrons can also help when studying a portrait’s commission and subsequent history (using evidence drawn from wills, for example) or a sitter’s extended family as depicted in a portrait. The second approach to research is via the works themselves. Online, the ODNB’s listing of 30,000 likenesses can be searched to bring together works by a particular artist, with results being further refined according to sitter (allowing one to locate, for example, Walter Stoneman’s photographs of scientists in the 1950s). The same can be done for places. For example, all recorded portraits located in Manchester, at Blenheim Palace or in the Scottish NPG – a useful way of making links between discrete collections. Similar searches, this time across the 10,500 portrait images, can bring together related portraits for comparison: for example, all ODNB images of Tudor gentlewomen or of early eighteenth-century naval officers. Thanks to an agreement with the MLA, the online ODNB is now available free via public libraries across the UK, with ‘remote access’ allowing library members to log-in from home—or anywhere—at any time. But as the national record of people in British history, ODNB editors are also happy to set up online collaborations to promote exhibitions, as recently for the NPG’s Brilliant Women and Tate Britain’s Van Dyck exhibitions. In 2007 the DNH&AS, owners of the Dorset County Museum, purchased one of George Romney’s finest early child portraits, Thomas Rackett, together with his portraits of Rackett’s parents. Whilst deciding whether to acquire the portraits the museum made the discovery that Thomas was holding a pair of pruners with which to cut down a hazelnut sprig. Romney’s portrait therefore intentionally shows a scholarly twelve-year old; this specific emphasis on natural history, directly relevant to the DNH&AS, significantly influenced the decision to seek to purchase the portraits. The paper discussed how further research revealed a wide range of related material and network of contacts, all demonstrating Rackett as an Enlightenment figure highly relevant to Dorset, where he was a parson for 60 years. Rackett spent three months each year in London attending lectures of the various learned societies to which he belonged. Thomas Rackett is still regarded as an important eighteenth-century antiquarian, particularly in the fields of archaeology, geology and natural history in Dorset and the South West. His work provided the benchmark for the Dorset County Museum founded only five years after his death. The paper revealed how the acquisition of the three portraits through very generous HLF and Art Fund grants and local fund raising, has resulted in exciting opportunities for further initiatives. The specific projects relating to the acquisitions are wide ranging and have included music workshops for very young children to ensemble performances by students of the local Thomas Hardye School, playing music from Rackett’s time as well as their own compositions. A series of workshops for adults with learning difficulties has centred on the portrait of Thomas Rackett. This inspiring programme, resulting in an amazing breakthrough for many of those attending, has now led directly to a request for further initiatives between the museum and this group. A Thomas Redcoat book and a museum trail for children – inspired by antiquarian collections of shells, fossils, coins, seals, archaeological excavations and topographical drawings – is underway, together with dedicated website pages relating to the portraits with some fun games using portraits both ancient and modern. A major HLF outcome will be an exhibition of portraiture of eighteenth-century Dorset sitters, Georgian Faces: Portrait of a County, for which the Rackett trio provides the context. Also supported by the Paul Mellon Centre for British Art, it will run from January to April 2011 and draw on a remarkable range of eighteenth century portraits from local museums, national institutions, and private collections. As a result of this study day it is hoped that the museum will also be able to collaborate with the Oxford Dictionary of National Biography for an on-line exhibition of some of the sitters featured in the exhibition.